Maybe to help me find some solid footing, during my hours (and hours) running, I’ve spent a lot of time thinking about glaciers. Few things in this world are truly simple, and most are deserving of close attention to nuance. Climate change is one of those things. We can track the changing surface temperatures, ocean salinity, water temperature, glacial melt, polar sea ice extent, sea level, shoreline erosion, permafrost melt, and so on — all of which are small parts of a hugely complex system. And all of which have, for many years now, painted a clear and compelling picture of a warming climate. Even as we begin to understand the complexity of the climatic system, though, we can often find puzzling contradictions, like surging glaciers, which appear to store energy for decades in a period of quiescence and then release a burst of movement so quick it can often be thousands of times faster than the glacier’s typical speed. Only about 1% of all the world’s glaciers fall into the category of surging glaciers, and they appear in one of the greatest concentrations in the Svalbard archipelago 500 miles north of Norway. 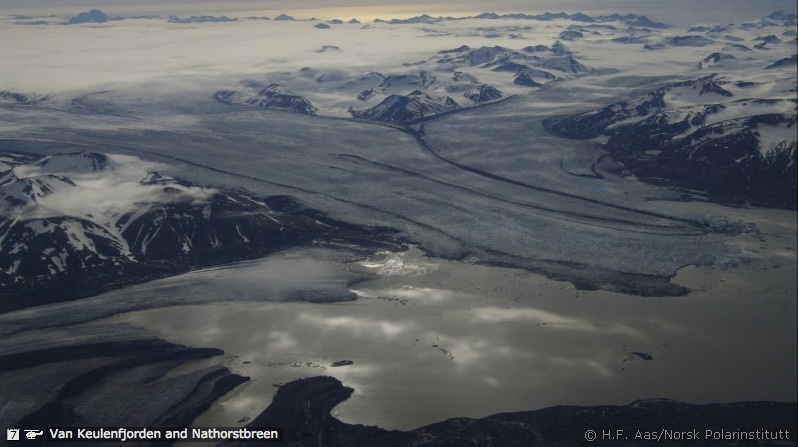 One glacial system in particular, Nathorstbreen, surged forward more than 15 km over the course of 4 years — sometimes moving as fast as 25 meters per day (2500 times faster than normal). A satellite view of the Nathorstbreen surge from ‘Surge dynamics in the Nathorstbreen glacier system, Svalbard’ by M. Sund, et al. Today in a period of global glacier recession, glaciers surge in many parts of the world. Surging glaciers complicate the investigation of glacier response to climate variability. Dramatic as it is, a surge is simply another data point in a massively complicated global system. A glacial surge does not mean that these glaciers are growing. Their volume is still dramatically decreasing. Between June and August 2015, in Svalbard alone, glaciers lost four and half million metric tons of meltwater every hour. That’s nearly impossible to imagine, but it matters. This is where beliefs and facts based on empirical observation meet — and where we need to work hard to be sure that far-reaching decisions are based on evidence and are not merely reactionary. Silencing the sharing of data, as complex or unimaginable as that data may be, is anathema to building resilience, community, or sound decision making. The power of nature is the power of a life in association. Nothing stands alone. On my haunches, I see a sunburst lichen attached to limestone; algae and fungi are working together to break down each rock into soil. I cannot help but recognize a radical form of democracy at play. each organism is rooted in its own biological niche, drawing power from its relationship to other organisms. An equality of being contributes to an ecological state of health and succession. A radical form of democracy begins with us, the people, making clear that facts, science, and transparency are essential — whether for building resilient communities or making intelligent decisions about our relationship with the natural world.